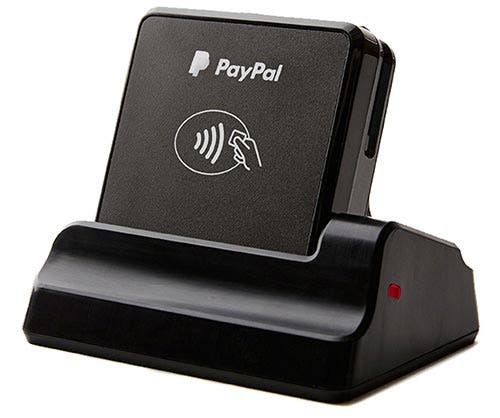 PayPal Chip and Tap Reader Guide. Ready to get paid on-the-go? 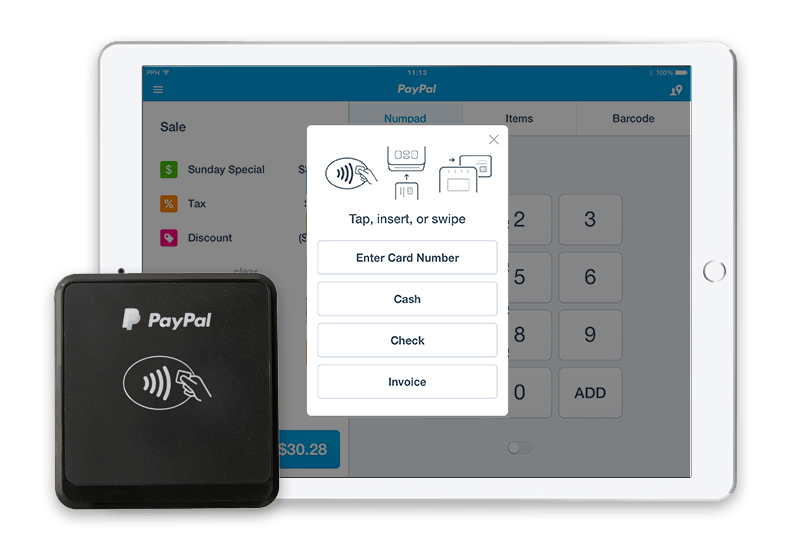 Just download the PayPal Here app on your compatible smartphone or tablet, pair it with your Chip and Tap Reader and start accepting payments where your business takes you. Get to know your Chip and Tap Reader. 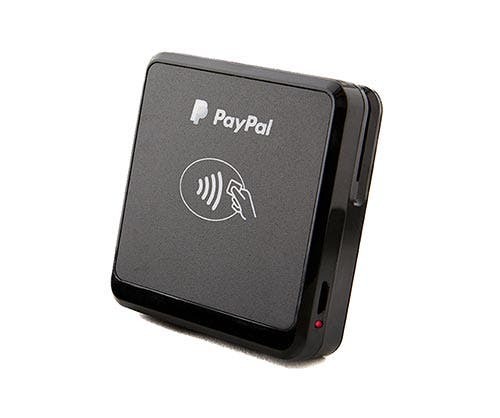 The PayPal Chip and Tap Reader is a secure and easy to use way to process chip or magnetic stripe cards and contactless payments. See how easy it is to get started with your Chip and Tap Reader. How to set up your card reader. Charge your reader by connecting it with the enclosed micro-USB cable to a power outlet. The blue blinking light on your reader will indicate it’s ready to connect. Turn on Bluetooth in your mobile device Settings. Open the PayPal Here app and tap the menu at the top left. Next, select Have a new reader?. You’ll be guided to find available card readers to pair and connect. Always keep your reader up-to-date. If required, please follow the on-screen prompts for the latest firmware updates. Great! Your Chip and Tap Reader is now connected and you're ready to accept payments on your paired device. To use Apple Pay®, Samsung Pay and other contactless payments, customers simply place their device near the reader and it will initiate payment. Apple Pay is a trademark of Apple Inc., registered in the U.S. and other countries. Samsung Pay is a registered trademark of Samsung Electronics Co., Ltd. Google Pay is a trademark of Google LLC. Chip and Tap Charging Stand. 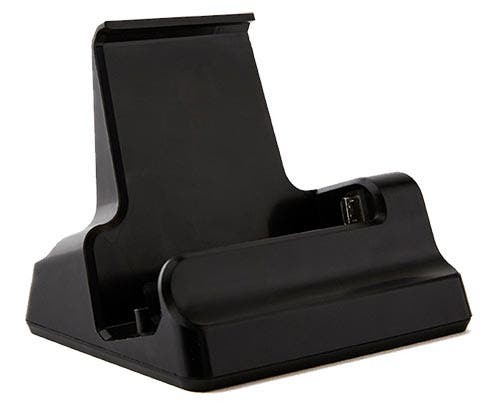 Keep your Chip and Tap Reader fully-charged and secured to your checkout counter with our charging stand (sold separately). Keep your Chip and Tap Reader fully-charged and ready to accept payments all day long. Heavy weight base and rubber pad helps keep your charging stand stable on countertops. Easily insert your reader to use in-store or remove so you can get paid on-the-go. Choose your Chip and Tap Reader accessories. Still need to get a Chip and Tap Reader?